The year is coming to a close and soon we’ll be heralding the arrival of 2019. With new smartphone trends already on the horizon, it’s about time that we reflect upon the year gone by. We’ve seen the advent of many new technologies, while we’ve also said goodbye to some older ones. Our phones have gotten faster and smarter, and there’s no sign of that growth slowing down any time soon. But there are so many smartphones released every year. If you’re looking for a new smartphone in the coming weeks, then how can you possibly decide what to get? There are so many to choose from, and all of them have their own quirks and downfalls. Here at XDA, we took some time to reflect on the past year and asked all of our writers to choose what their favorite smartphones of the year were. While you may have a rough idea of what you think is the best phone of the year in each category, our writers may surprise you. I believe the OnePlus 6T is the best device in this category. It’s an excellent performer, has great battery life, maximizes the screen real estate as much as possible with the least obnoxious notch design, and its software is the most familiar for someone who has been a Nexus/stock Android fanboy for years. There are a few devices on the market that are better than the 6T in certain aspects, especially in regards to the camera, but I don’t think there are any devices that are better in every way. Thus, why spend hundreds of dollars extra to get a phone that is only marginally better than the OnePlus 6T? The Huawei Mate 20 X is my personal favorite this year. It has the nearly bezel-less waterdrop notch design of the Huawei Mate 20 combined with the Huawei Mate 20 Pro’s camera setup. It also has the latest Kirin 980, making it one of the very few huge flagship smartphones. I love big phones, and the Mate 20 X is the best big Android smartphone on the market. It makes the Galaxy Note 9 look tiny in comparison. It doesn’t have all the bells and whistles of the Mate 20 Pro like 40W fast charging, wireless charging, or 3D face unlock, but its large 7.2” display just can’t be beaten. It’s the first smartphone I actually feel comfortable watching TV shows and movies on. Xiaomi has long been the king of mid-range smartphones, but the Asus ZenFone Max Pro M1 gave the Redmi Note 5 Pro a run for its money. Asus opted for near stock Android on the ZenFone Max Pro M1 and stuck a huge 5,000mAh battery in it. It’s not the best at taking pictures or making videos (EIS is disabled by default), but Google Camera ports can help elevate its mediocre camera to an acceptable one. It’s a damn shame that the best mid-range devices never come to America, where the only decent mid-ranger that doesn’t cost an arm and a leg is the Nokia 7.1. The Xiaomi Mi A2 Lite is an incredible device in the low-end tier. If you end up buying a budget device, you often sacrifice long-term software support. That’s not true of the Mi A2 Lite, though. It’s an Android One device meaning it runs basically stock Android and has 2 years of guaranteed software updates and monthly Android security patches. Although the Snapdragon 625 is fairly old by this point, there’s a reason it’s so highly utilized by Xiaomi—it’s no slouch. The Mi A2 Lite has a respectable 4,000mAh battery that helps the phone easily last through an entire day. This is a close race between the Honor Magic 2 and the Xiaomi Mi Mix 3. Both smartphones have an almost entirely bezel-less front thanks to the slider mechanism, but the Honor Magic 2 has a neat gradient color finish while the Xiaomi Mi Mix 3 has Xiaomi’s signature ceramic body finish. The Jade Green Mi Mix 3 has the best overall design in my view, but the Honor Magic 2 in Gradient Blue is really close behind. Although they weren’t the first to the scene with a night mode camera feature, Google was the first to nail it with Night Sight on the Pixel 3. OnePlus, Xiaomi, and Huawei/Honor all have their own night mode features, although Huawei’s is the closest to Google’s in terms of quality. Night Sight is this year’s must-have feature, and that’s evident by the fact that so many modders are rushing to port the latest Google Camera app to their own devices. Google has proven that a smartphone with a single rear camera can take photos that are just-as-good, if not better, than smartphones with dual, triple, or even quad rear cameras. I’m excited to see which design trend will dominate 2019. 2018 is clearly the year of the notch, but as the year ends, we’re seeing two new trends emerge: slider camera phones and display holes. The former is championed by the Vivo NEX, Honor Magic 2, and the Xiaomi Mi Mix 3, while the latter is championed by the Samsung Galaxy A8s, Huawei Nova 4, and Honor View 20. I am a huge fan of the slider design, and I see further refinements of it as the way forward. It’s a mild inconvenience to deal with if you take selfies frequently or rely on face unlock, but the flip side is that the manufacturer can pack all kinds of sensors behind the display rather than sacrificing display real estate via a larger display cutout. Without a doubt, Huawei has improved the most in 2018. When you compare year-on-year improvements that other manufacturers have made to their smartphones, you’ll mostly find that they’ve made incremental improvements to performance, battery life, and the camera quality. But Huawei has made several radical changes to their smartphone lineup in just a single year. Compare the Huawei Mate 10 Pro to the Huawei Mate 20 Pro, for instance. The Mate 20 Pro adds an in-display fingerprint scanner, 3D facial recognition, faster 40W wired charging, wireless charging, reverse wireless charging, substantial camera improvements with the addition of a 40MP main sensor as part of a triple rear camera setup, wireless desktop mode, and obviously all the standard incremental improvements like a better SoC, larger battery, etc. For most devices, the next generation model is hardly worth the upgrade. The Huawei Mate 20 Pro is an exception because it’s substantially better than the Huawei Mate 10 Pro from last year. OnePlus makes just enough compromises to offer a device with some high-end flagship specs at a mid-range price. I actually prefer the OnePlus 6 over the OnePlus 6T. The rear fingerprint scanner is better and it has a headphone jack. If performance and price are the most important things to you, the OnePlus 6 is a no-brainer. I’m not going to try to convince you the Pixel 3 has more features than you might find on a Samsung flagship, but for the features I care about, the Pixel 3 is the best. I want a great camera, a phone that’s not too big, frequent and fast updates, and the best Google experience. For that, the Google Pixel 3 is the perfect flagship phone for me. Software and updates can sometimes be an issue with mid-range devices, so starting with Android Pie is a good thing. The Nokia 8.1 will also receive steady updates from HMD Global as part of the Android One program. The design of the device is really nice for a mid-range device as well, with relatively slim bezels and high-quality build materials. You even get dual cameras on the rear. You’ve probably figured out that software is a big deal to me, so Android One is a must-have at this range. Low-end devices are low-powered, so you don’t want the software to bog it down. The Xiaomi Mi A2 Lite is a very nice device with dual cameras, a big battery, and a good display. The device was released over the Summer with Android Oreo, but Xiaomi has already rolled out the Android Pie update. When I think about phones from 2018 that looked futuristic and cool, the Mi Mix 3 is what pops in my head. The front is almost all display and the sliding mechanism for the camera is a great idea, not to mention fun to fidget with. Night Sight is the first camera “mode” that I’ve consistently used. A lot of camera modes are gimmicky and don’t have many use cases, but Night Sight is genuinely mind-blowing. I love it. I might be in the minority on this one, but I think the display holes (a.k.a. hole punch) look pretty cool. I certainly prefer the look of the display holes over the dreaded notch. You still can’t use the screen space that is blocked by the display hole, but I just think it looks better. The Essential Phone recieved a ton of updates over the past year. It’s always a trendy pick for “best cheap Android phone” since it goes on sale so often, and that’s thanks in large part to Essential’s support. I don’t know if there will be an Essential Phone 2, but Essential has done a lot to become a fan-favorite OEM. The best flagship device for the value is going to have to be the OnePlus 6. The only reason why it would even be considered the best is the price and hardware. The camera is not good, the device feels cheap, haptics are bad, speakers aren’t good, and the display isn’t great. However, it does have the Snapdragon 845 and large battery for a low price for the hardware. It even has a headphone jack. The best flagship device for the features is the Mate 20 Pro. The phone has a triple camera system, the latest version of Android, an in-screen fingerprint scanner, true face ID hardware, and the fastest Android SoC on the market. It has the same features every other phone has plus more. I think it is by far the best device with the best features. The Samsung Galaxy A8s is the best mid-range device by far. It’s one of the first devices using the new punch hole display format and it has the Snapdragon 710. The Galaxy A8s is running Android 8.1 and is planned to receive One UI very soon. It also has a triple camera system with some of the best mid-range cameras. The best low-end device is the Huawei P20 Lite. This device is running EMUI 8 and has some of the best features on the low-end scale. It is a fast and very good device for the price you will be spending. If the mid-range and flagships are out of your price range, this is the best phone to get. The design awards have usually gone to Samsung and I think this year is no exception. The Samsung Galaxy Note 9 is a nice and large device in one of the nicest blue colors I have ever seen. The curves are perfect in this iteration of what really started with the Galaxy S6 Edge. It’s almost perfectly symmetrical and just feels great to hold. The best software feature, by far, is Call Screening from the Pixel 3 and Pixel 3 XL. This is the best feature because it’s actually useful. Most other phones get these random AI features that are honestly useless. Call Screening is something that works on both friends and spammers. It is great for trolling and for actual use. The best new hardware feature, specifically to Android phones, is the face ID sensor in the Mate 20 Pro. This technology is currently in the latest iPhones and iPad Pros, but hasn’t really made it to Android devices yet. Huawei managed to get it working and it works great. It is fast and convenient with the benefit of being secure. The Mi Mix 3 is the most improved device over the Mi Mix 2. In a year they were able to bump the specs, design, cameras, and software up a notch without adding a notch. They used a sliding phone mechanism and a ceramic back without increasing the price. Yes, the OnePlus 6, not the 6T. The midrange category has crept up in price over the years, but when a Note starts at $1,000 dollars, $529 is “midrange.” As far as the OnePlus offerings this year, they’re great devices. Both phones run one of our favorite types of Android with OxygenOS. Both have tons of RAM and a Snapdragon 845. The 6T this year brings a slightly bigger battery, a less reliable fingerprint reader in the display, and the removal of the headphone jack. For me, between the 6 and the 6T, having used both, the 6 is a better buy. This one is easy for me. Honestly, this phone has absolutely everything. The Note is the pinnacle of Samsung’s smartphone work. If you buy the very expensive Note 9 you’ll want for nothing – SD Card, tons of RAM, huge storage, a Snapdragon 845, S-Pen, water resistance, stereo speakers, wireless charging, great camera, a headphone jack, and more. The display is great, the build quality is top notch, and while the software was already great (from a former TouchWiz hater), OneUI is awesome. This phone is as close to worth $1,000 as possible. Buy one. I don’t have a ton of experience with budget phones. The easy choice is the Motorola G series, but this year I’m more inclined to recommend the Nokia 7.1. It’s an interesting looking device and Nokia has been doing some really interesting things with Android and updates. The Nokia 7.1 is loaded with Android One and some great build quality. It’s an unlocked device with a big, modern-looking display. It’s also got an SD Slot and is Dual SIM. It’s an Android One devices, so we’re looking at fast updates and clean Android. It also comes equipped with “turbocharging,” a decent sized battery, and a headphone jack. I can’t say enough about how gorgeous this phone is. The Twilight finish is stunning and unique, and the green and blue options with the textured glass are also great. The camera array on the back looks distinct. It’s not my favorite phone, but I do think it’s a looker. One of my favorite, perhaps lesser known, features is call screening from Google. In an age of robocalls from spammers, it’s great to be able to screen the robots with a robot. The feature just works, and it feels futuristic when you use it. This one is a bit of a mix of hardware and software to be honest, but I’m just constantly and forever pleased with the results of this camera. It’s an absolute reliable joy to use. This is to say nothing of Night Sight, which is mostly a software feature. Razer took their first phone and improved absolutely everything about it without changing the core identity of the device. We kept the gorgeous high refresh rate display and added: wireless charging, water resistance, a chroma logo, improved cameras, a Snapdragon 845, higher brightness, and a big cooling chamber. The phone is pretty great at a pretty great price. The Xiaomi Pocophone F1 is one of the shock releases of the year, featuring a Qualcomm Snapdragon 845 chipset at an incredibly low price. It has a poor build quality for starters, but the company had to cut corners to get its price as low as possible. The Samsung Galaxy S9 features a superior display to most smartphones, an S-Pen with even more features over this device’s predecessor, and all of the Samsung Experience and OneUI features. It’s a no-brainer – the Samsung Galaxy Note 9 is the best flagship of the year for me. Maybe a controversial pick, the Honor 8X features 2018’s trendy notch with thin bezels and good build quality. It’s a great device for the money and looks beautiful. Even with its confusing naming scheme, the Xiaomi Redmi Note 5 (Xiaomi Redmi 5 Plus in China) is a great device at an even better price. The official upgrade support and community developer support can’t be beaten by pretty much any other phone out there. The Xiaomi Mi Mix 3 has a hefty feel, slim bezels, and the best design I’ve seen so far for hiding the front-facing camera. This is a tie for me between Google Playground and Night Sight. While Google Playground is fun to play with, it can, more often that not, be a gimmick feature. Night Sight is functional, which is why I’ve also chosen that. I’ve always preferred the sensor on the back, but being a minimalist has led me to appreciate the sensor being hidden underneath the display. I don’t think it will sell well but the amount of accessories they are launching with it shows that they are making a true effort. Having used both the OnePlus 6 and the OnePlus 6T, the OnePlus 6 takes the cake for me as the best flagship of 2018 for value. A fast fingerprint sensor and a headphone jack are what pushes this one over the edge for me. The OnePlus 6T features a slightly larger battery, but the larger battery does not justify those trade-offs for me. Having used both devices, I can confidently say that I prefer the OnePlus 6 over the OnePlus 6T for value for money, especially given that it’s slightly cheaper as well. I think choosing the Samsung Galaxy Note 9 here is a no-brainer. It has everything, and by everything, I mean literally everything. A fast fingerprint sensor, a stylus, a great camera, a large battery, and even a headphone jack. The Samsung Galaxy Note 9 is probably the phone of the year for me. I’m a huge fan of Xiaomi, and the Xiaomi Mi A2 is one of the company’s best devices released this year. With an incredible camera for the price, the only thing this device lacks is a headphone jack. If you can get over that, then this is a solid pick. If a headphone jack is a must, then I’d recommend the Xiaomi Redmi Note 5 Pro instead. The Xiaomi Redmi Note 5 is a beautiful device powered by a Qualcomm Snapdragon 625, and it’s a great smartphone for the money. If you’re on a budget, you can’t go wrong with this one. I have the Xiaomi Mi Mix 2S, and I thought that was beautiful. The Xiaomi Mi Mix 3 is the best-looking smartphone of 2018 for me, with its magnetic sliding camera being the best-looking solution for foregoing the notch yet. This isn’t a hard choice for me at all. Night Sight is an amazing feature. It’s one of the most surprising features of 2018, and one of the most powerful as well. I’ve even gotten a lot of use out of it, something that I never expected. While I personally dislike the OnePlus 6T’s in-display fingerprint sensor, I like the idea and think it’s very cool. I can see manufacturers improving on it further, and already in smartphones like the Huawei Mate 20 Pro are we seeing it get faster, more accurate, and just overall better. My experience with the Razer Phone 2 is above and beyond what the Razer Phone once was. It looks nice, it’s fast, it’s just an overall great experience with the 120Hz display as well. Everyone has different criteria for what makes a phone the “best.” We made our picks and now we want to hear yours! 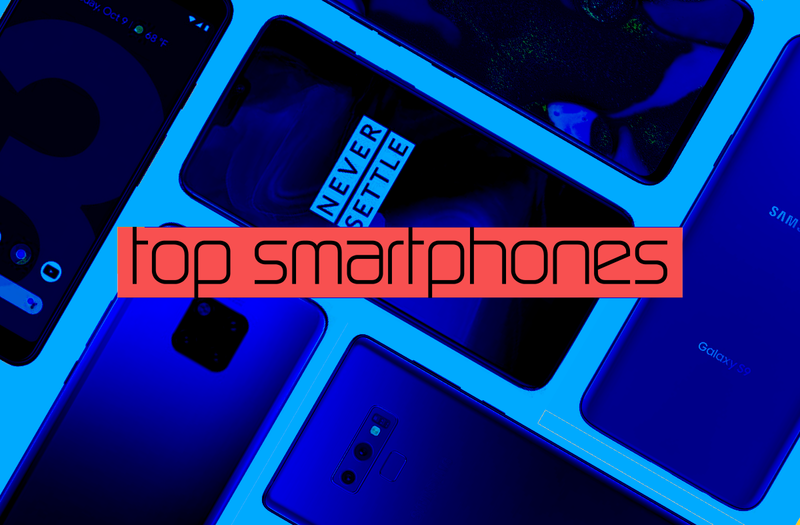 Share your top smartphones of 2018 in the comments below!